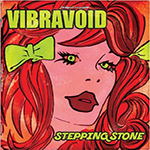 Dj Astro's: Vibravoid: Stepping Stone 7"
Listen to the latest Astral Visions Mixcloud Show! It's no secret that Vibravoid, one of Germany's leading psychedelic rock bands, is one of my favourites, so naturally I'm very excited every time they have a new release out. These guys have never let me down, so I just KNOW they will deliver the mind-bending goods. This new 7" just out on the marvelous Fruits de Mer Records is of course no exception, this is pure aural ear candy. This 7" EP includes three covers of classic psych tracks from the 60s. First, they do "a bit more" psychedelized version of "Stepping Stone" by The Monkees, what a clever move! I'm sure this will go down well in live situations as well, very groovy stuff! The next track is something new for Vibravoid: "Hole in My Shoe" (originally by Traffic) has amazing quest female vocals by Italian mod jazz singer Viola Road! This really makes a difference (although I love Christian's vocals too, of course). This version is heavenly beautiful with sitar, mellotron, organ and other psych tricks. Just wow! Vibravoid has released a couple of earlier versions of "The White Ship" (H. P. Lovecraft) before, but the version here is even more spacey and hazy, if possible... Also a bit longer than on their Gravity Zero album released in 2012. This will transport you to an another zone for sure... Very trippy! Get this piece of art a.s.a.p. since Vibravoid/FdM stuff usually is usually sold out very fast. Magic Bus: Seven Wonders / Eight Miles High 7"
nick nicely: 49 Cigars 7"
Teema: Mieletön malli. Teeman kuvien tekijä: sololos. Sisällön tarjoaa Blogger.